Since Vectorworks 2013 it is possible to create hierarchical list browsers ie with rows which can be expanded to reveal other rows, recursively. We will try in this article to get the result shown above. This is exactly the way the class list browser is working in the Organization dialog. 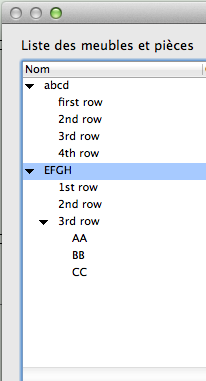 When the user clicks on the expand/collapse arrow, he expects to expand or collapse the tree below the clicked row. We have to deal with this. When the user closes a row, the list browser looses all the data attached to hidden rows except the text of the hierarchical column. All the other columns, styles, item data, etc, are lost. 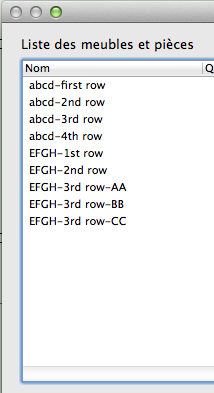 We have to restore all these when the user opens back the row. Vectorworks 2019: It looks like the above is not true anymore as the ListBrowser restores the content automatically. This page was last modified on 28 January 2019, at 10:58.